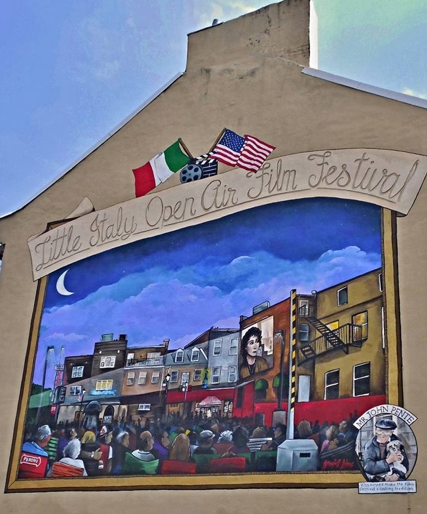 As recently shared with the public and media, the Little Italy Open Air Film Fest is on hiatus for 2018. However, there is hope the event will continue in 2019. Every effort was made to continue this summer tradition after Film Fest organizers announced they were discontinuing management of the 8-week event for 2018, after having organized it for 19 years. Although from 1999 through 2017, the movies were held on the private parking lot of Da Mimmo Restaurant, owner Mary Ann Cricchio (the primary organizer), explained she would be unable to oversee its physical presence in 2018 since she is not in Little Italy while the Film Fest normally runs (she personally escorts group tours in Italy). Mike Castino, vice president of the Little Italy Lodge, stepped in to embrace the challenges of the Film Fest, and had looked into an alternate location in the neighborhood. Stratford University's parking lot on the east end of Little Italy seemed to be the answer for a new locale, and although the culinary school was amenable to the idea, Castino hit too many snags to properly plan the event for 2018: insurance, planning time, and raising revenue needed to fund such an expensive and huge undertaking. By May, those challenges prevented Castino from planning the Film Fest to its usual standards for this summer. On facebook and via email to Promotion Center for Little Italy, the public has expressed its disappointment in learning the Film Fest will not take place this summer. Mike Castino, who took on the responsibility to carry Little Italy’s Open Air Film Fest into the future. Although on hiatus for this summer, we feel confident the Film Fest will return in 2019! HISTORY OF FILM FEST: The late "Mr. John" Pente wholeheartedly supported the Film Fest for 11 years before he died at age 100 after living in 'The Neighborhood' his entire life. Mr. John had allowed a movie projector to be set up in his third floor bedroom window to project films onto a big screen across Stiles Street. After he died, Mr. John's nephew, the late Ray Lancelotta, purchased the house and allowed the Film Fest to continue. When Ray died in 2014, his children allowed it as well. Today, the house belongs to a new owner who had graciously agreed to continue the Film Fest tradition. Between 1999-2017, the event was organized by the Original Little Italy Restaurant Association. This mural on Pratt & High Streets, sponsored by Peroni Beer, is a tribute to the neighborhood's Film Festival and is the work of artist Marshall Adams. It includes an inset honoring the late "Mr. John" Pente and his dog, Gina, the resident who wholeheartedly supported the showing of Film Fest movies from the third floor bedroom window of his home.